Or Make Cupcakes Your Main Dessert! Baby shower cupcakes to go with your baby shower cake ... some awesome, very cute ideas to coordinate both. Or, serve them as your main dessert! Yum!! Are you up for a challenge? Ready to make some cupcakes? Well, even if your not, here are some great ideas for cupcakes, for your ambitious co-hostess ;) ... to go with your baby shower cake. Don't feel like decorating cupcakes? Make it easy on yourself! Discover a huge variety of adorable baby shower cupcake wrapper designs for many different types of baby shower themes. 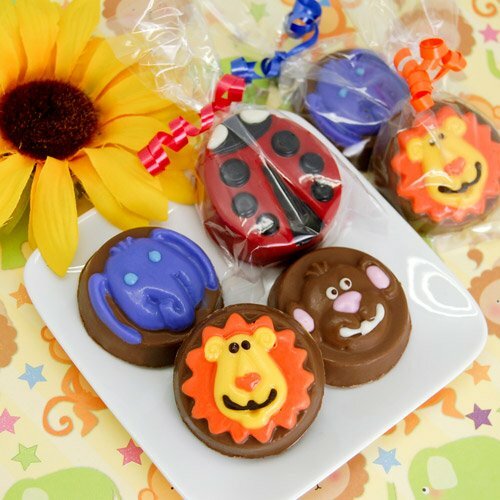 Find monkeys, cowboys, jungle animals, ladybugs, undersea creatures and more to make fun, decorative cupcakes for your baby shower. Download and Print A Selection From Our Cupcakes Gallery. Print one of our ideas and take it to your local specialty bakery and have them make it. Included on the map below, are bakeries that specialize in Baby Shower Cakes and Cupcakes. Just click on "View Larger Map", at the bottom of the map, to see each individual bakery. Add your city/state name to the search box at the top ... "baby shower cupcake bakeries _________", and locate all bakeries near you ... it's easy! Looking for cupcake favors? Check out these cute cupcake candle favors on our Unique Baby Shower Gifts home page. Cupcakes can be the main dessert, or an additional touch. They’re so cute to make if you can find the time. Again, keep your theme in mind when selecting a design. How much extra time do you have to spare? Can someone help you? Does Mom-To-Be Love doing this kind of project? It could be a creative task that she might enjoy! Be mindful of your abilities ... like we said, store-bought baby shower cupcakes are just fine and a specialty bakery would be great to re-create some of these adorable designs. Tip: Cupcakes for your baby shower look great when coordinated with the main baby shower cake. Try these pastel colored cupcakes for a Holiday baby shower. Simply use white frosting, put sugar in a small container, add food coloring to the sugar (small drops at a time) to get the desired color, and sprinkle over the frosting ... it's easy! Tip: Use the small re-usable soft-spread butter containers, if you don't want to use your good Tupperware with food coloring. A cool idea for a baby shower favor to coordinate with a Cupcake Theme ... a shower cupcake mix. They also have the mini wisk and measuring spoons available to purchase. Having a Spring/Summer Baby Shower? These easy to decorate Basket Cupcakes are perfect for a Spring/Summer baby shower AND great decorations for around your main cake. 1. Frost however many cupcakes you want. Cut flower-shaped jujubes in half width-wise and set them on top of the cupcakes, then glue M&M Mini's to the flower centers with a dot of icing. 2. To make the leaves, cut green jujubes in half width-wise, then cut each piece in thirds and set them near the flowers. 3. Finally, add a piece of black licorice for a handle and tie on a colorful fruit leather bow. Tip: If you want more of a distinct "boy" or "girl" look, just change the candy color and use a pastel fruit leather, or simply a colored satin ribbon. brownie favor pops and more!